Sarge those are great. Love that last one in figured walnut. I'm in for one as well, just let me know. I may just pick one up in person while I'm up visiting the family. Thanks, Spyder. That sounds good and I?ll keep you posted. Pick up / delivery would be cool! Hope to meet you one of these days. Thanks for the reply, when you get to be my age, one thing you aren't is in a hurry, be looking forward it. I haven?t been onboard here much lately. I?ll check in and read a little but haven?t posted much. Been busy with life the last month or two - I turned 50, my older daughter graduated high school, I went to Washington D.C. with about 1,000 5th graders, 20th Wedding Anniversary....got family vacation in a couple weeks. I know everyone is busy and I?m certainly not whining. It?s been great! In the middle of all that, I moved everything out of my basement/shop to paint walls and the floor. I hauled off several truckloads of clutter and put 18 feet of shelving x 6 feet tall on one wall, ordered 12 more feet for another wall. I have way more storage space and plan to add more workbench space. I?m back up and running and worked some yesterday. 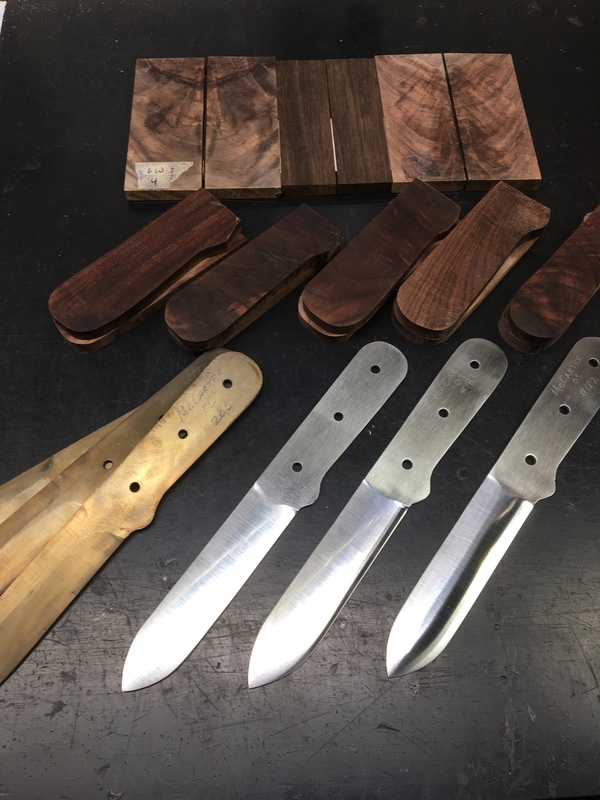 Blanks are heat treated by Paul Bos. First 3 are convexed at at the target weight of 5.5 oz. before I taper the tangs. I?ve gone through a ton of walnut to look for the best scales. So far I have a decent assortment of straight grain and varying degrees of figure. I also sent some to be stabilized; hope to get it back soon. I hope to have way more regular updates on this progect. Looks awfully good Sarge! Glad some time has freed up a little to start back at it. I need to do what you've done to my shop. haul a bunch of stuff off, clean out and make more work area. Oh, MAN! My salivaries are workin' overtime now! ANY of that figured walnut would tickle me plumb to death! Sarge I think Horace would want one of these too. You got it dialed in I think. Thanks for the update, glad you are back at it. Thanks, as always, guys. I appreciate the feedback. 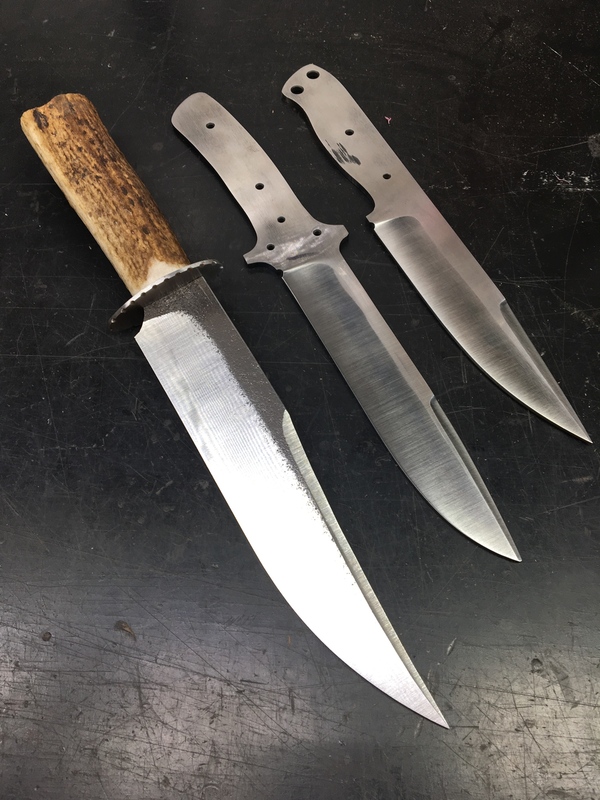 I worked some today and have a couple blades close to ready for scales. 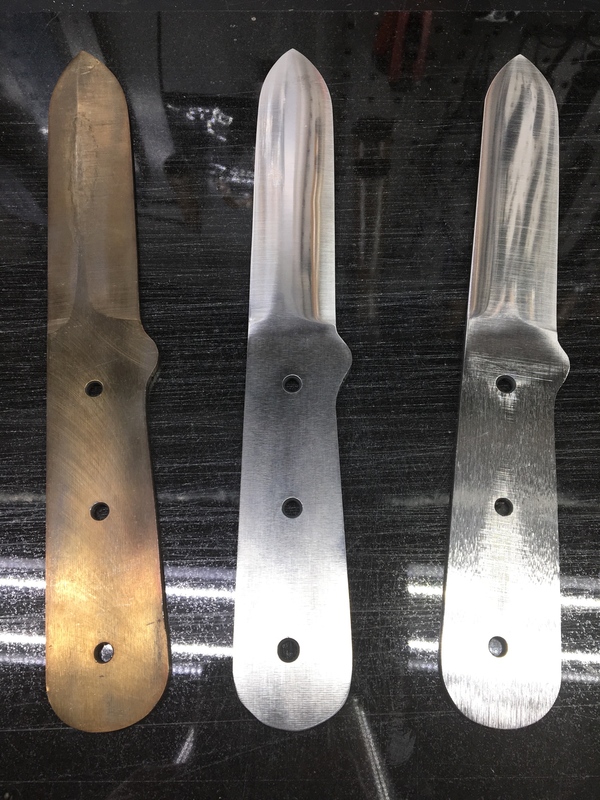 From flat ground blank received back from heat treat on left, to convexed bevels in center, to the convexed blade with tapered tang on the right. 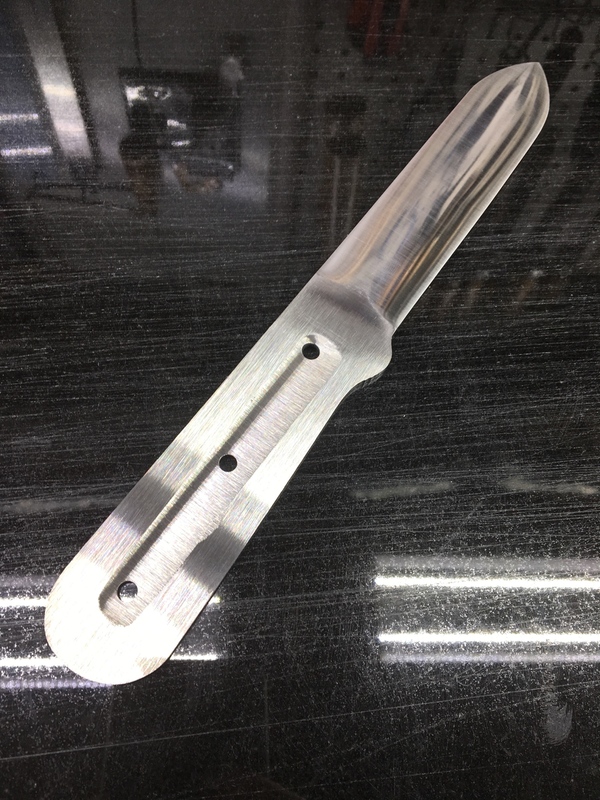 Blade with tapered tang and hollow ground tang to achieved desired weight. Hand sanded this blade to 400 grit, then used a Scotchbrite belt for a satin finish. Probably won't get much else done before vacation but I'll post some more pics when I get back. A little knife time today after a long week at work and vacation the week prior. 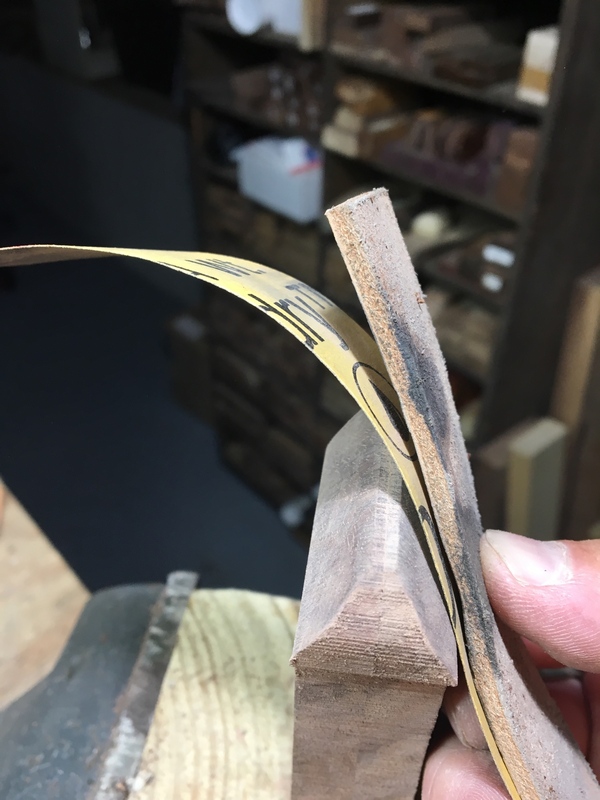 Shaping some walnut scales. 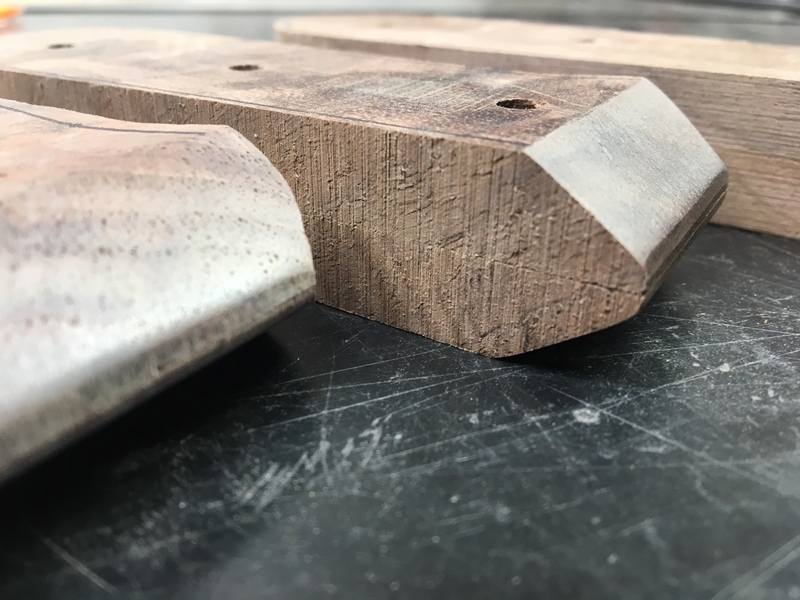 I bevel the front edge of most scales at 45 degrees but give these a steeper angle to match the original. 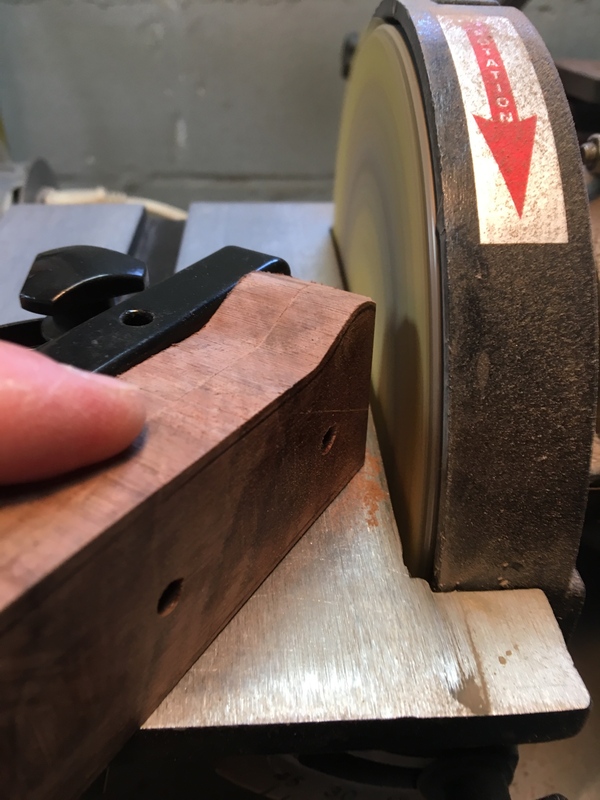 Angle guide on the disc sander works well. Hand sand to soften the hard angles. These 3 sets are about ready for mounting. 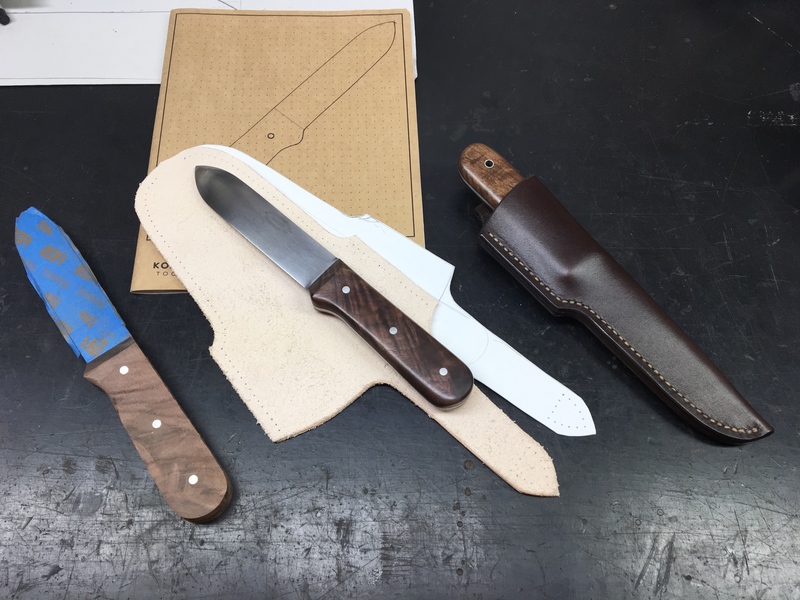 Not Kephart-related and not very bushy .... but I've got a few other blades on the bench. I like those blades in the last photo (but not as much as the Kephart). The smallest one on the right looks like it would be a good skinner/camp kitchen knife. Thank you, sir. That smallest one is sorta stabby but should be practical enough for a multi-purpose knife. I can't even remember the last knife fight I was involved in. 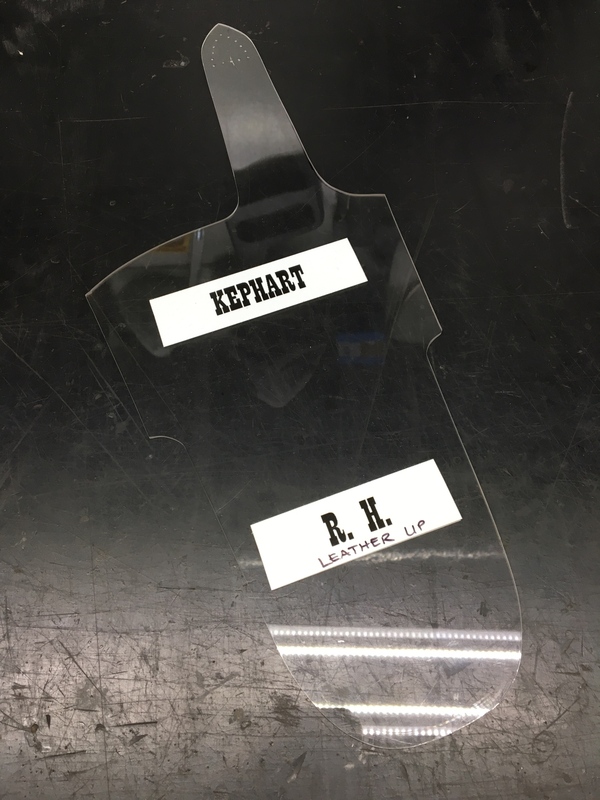 I know I'll be much happier with my nice new Kephart. I can think of LOTS of situations where one of those would come in handy! I got a set of scales on one blade tonight. I?m trying West Systems G-flex epoxy for the first time. I?ve got two other blades about ready for scales. Not much progress lately but I?m starting to inch along. I?m pretty happy so far with that big Bowie...going for an old Sheffield look. I feel like I got pretty close on the proportions. Still gotta make and fit some sort of pommel. A pommel? That surprises me. Primarily because when I tap on the pic to enlarge it; I don't see any tang exposed out the end. But then, ah ha- the hilt is not yet fixed? The Sheffield Bowies were arguably the best-looking and most well-proportioned of all the Bowies.....foreign and domestic. Many of the southern Bowies were cranked out by various country blacksmiths for protection during the Civil War and were not very nicely finished or balanced. 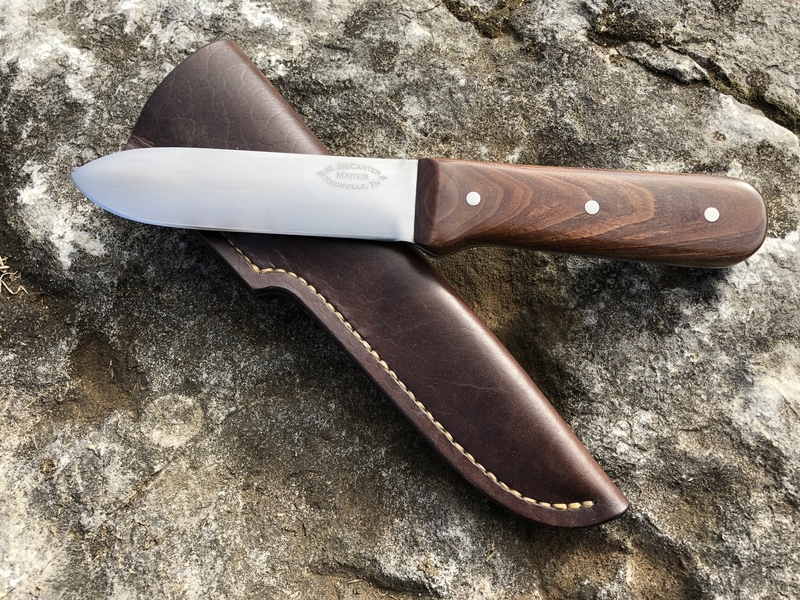 The Bowie that was carried by riverboat gamblers & travelers along the Natchez Trace tended to be a little nicely made, but almost ALL of the Sheffield products were very nicely made and many were produced as cased 'presentation-type' knives with engraved handle escutcheons showing the names of the presenter and the honoree to whom it was given. At one time I had a chance to buy a Rudy Ruana-made 'Mexican' Bowie in a gift shop in Choteau, Montana for a mere $300.....but being a nearly penniless farm kid & college student at the time, I felt I had to pass. I've kicked myself ever since! Man, that Ruana would have been a steal but I understand. I'm afraid I'll soon be letting go of 70 frogskins for another book! I have really enjoyed it. Both the writing and photography are outstanding! Looks like a book to have Sarge. Thanks for posting that link. That middle one looks absolutely terrific Mike. camp-axe heads designed by ?Nessmuk??a.k.a. excellently tempered; belts, sheaths, etc., furnished. Oh that is really interesting. Perhaps the sale of these Colclesser knives never got going for some reason. A few perhaps. What is there? Two that are known, the one you saw and the one some museum has that was Kephart's personal knife. I was talking with a guy a couple days ago. One of his pontifications was that History never changed. Of course I explained to him how it does change. Thanks for quoting that for us Sarge. I have a question- HK says something like: I have just such a knife here before me... his description follows that the blade and hilt are 4.5 inches long. The famous advertisement lists 4 inch and 5 inch blades. Is the museum blade 4, 4.1/4 or 4.1/2 inch long? The handle on that knife looks like it has been refurbished a few times. To clean it up I imagine. Looks like some of his blade was honed away too, but length lost as well?. I have the impression the blade in the museum was listed as 4.1/4 long- maybe wrong. 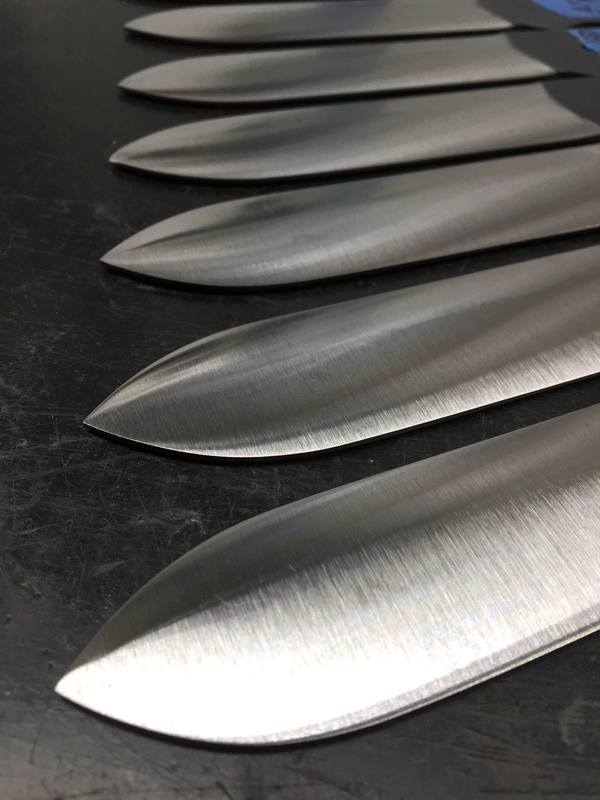 Gorgeous knives Mike, great job. The photos look great, however I don't think they do justice to the design & craftsmanship. I am going to have to inspect & trial one someday. Here are some side x side pics of the knife Ethan Becker owns and the knife in the Kephart museum. These are the only two pieces know to exists ... I'm still hoping to find one at a yard sale one of these days. Looks like the museum knife is the 4" version but I couldn't find anything detailing its specs. I'm not sure we know how close to the original dimensions the museum knife is now. The handle contours are obviously different. Maybe the museum knife was contoured differently because it was smaller or maybe hard use eroded the wooden handle. For me, some of these mysteries add to the appeal of the knives. Blade forums won't let you look at large versions of the photo unless you are logged in. Might have to join up. I was already on that forum but have not been there for years. I completely forgot it. Thanks Sarge. I sorta recall the museum listing some dimensions, or maybe some was allowed to measure it and wrote about it. Sarge, do you wonder, as I, how much the stabilized walnut might impact the target weight? It is hard to guess a % change in weight between stabilized vs natural wood+finish coat. I haven't used it. Which also makes one consider, we cannot measure the % change in weight from one Colclesser and another. I do applaud your strict use of the example you have. Which is why the question came to mind. There is just the one example, and if they were hand ground as we believe, then there must be some difference in finished weight, even in some cases due to the density of the scales. All that to say: woohoo. DAMN, you're and busy man! You really do some nice grinding, Sarge! My reaction? Just WOW! Those are terrific. It looks like that. Perspective; I think they are all about the same. Thanks, guys. Yep, perspective makes the upper blades look pointier; they are all the same...or as close to the same as I can make them. You raise some good points, unknown. I weigh the blanks at several stages during the process - after the convexing, after tapering the tang, etc. They are handmade so there are some variances. The biggest variable, though, is the wood. Of course the stabilized blocks and scales are noticeably heavier but there are also slighter differences in the natural pieces, especially from different sources. The original is 5.5 oz. I've only hit that target a couple times, several knives have been about 5.75 oz. 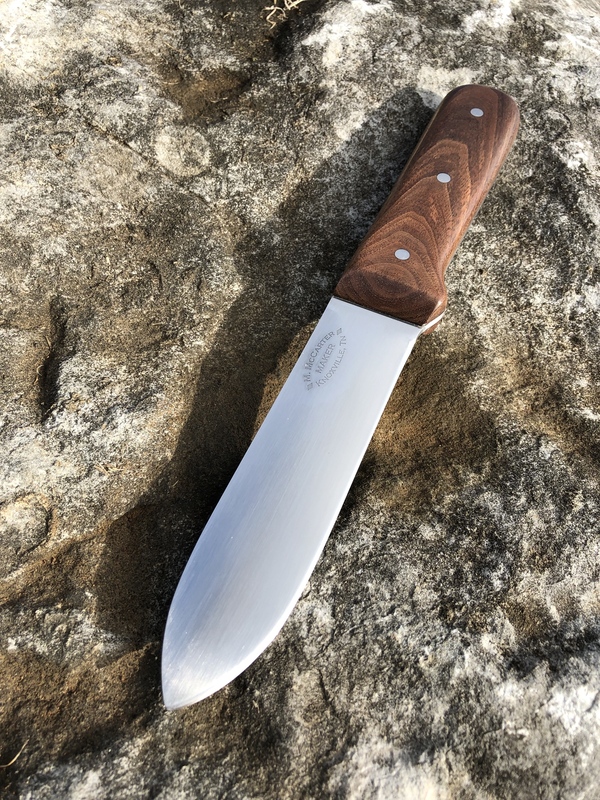 If I can get the finished knife under 6 oz. and it has a good balance, I'm satisfied. Unless the user was holding the original in one hand and a new in the other, It would be difficult tell a difference. You're right, we don't know the weight tolerances between the production Colclessers. The one on which I've based my knives could be average weight, or lighter or heavier. A little mystery makes it all the more interesting. 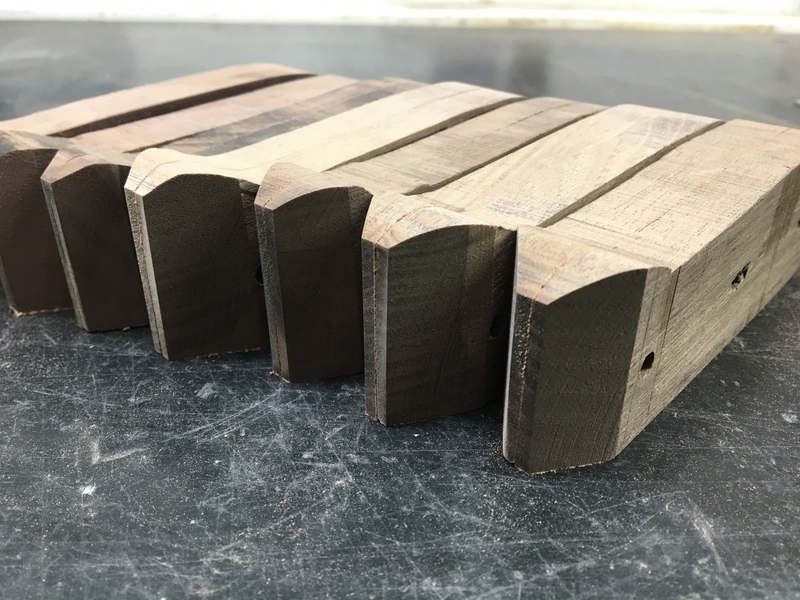 This is black walnut I cut into blocks myself. I selected the best blocks (12 out of 65 or 70 pieces) and sent them to be dried, stabilized, and cured. Black walnut scales stabilized by Wood Dynamics.